We are delighted and very grateful to have received the winning vote at Bournemouth Soup ‘s crowdfunding event last night (1st May), and are excited about what this means for how we are able to grow and develop Bournemouth Repair Cafe this year. We were presenting our pitch alongside 3 other very deserving local projects. Do check out Bournemouth Soup’s FB page for more info and future dates. Thank you to everyone who came along to The Henry Brown Youth Centre on Saturday for the Give and Take, Bournemouth Repair Cafe and Win On Waste!. This time our techie Fixers were kept particularly busy with a hoover, touch, dehumidifier, sewing machine, hedge trimmer and more! We also tightened the breaks and stabilisers on two kids bikes and fixed some trousers and a cardigan amongst other things. What a great event! As always a huge thank you to our lovely volunteers for making this project possible and a special thanks to Gumtree UK for asking us to be part of #NationalUpcyclingWeek. See you all again in Boscombe on Saturday 5th August! Bournemouth Repair Cafe – Volunteers needed! Are you handy? Do you hate waste? Could you share your repair skills and give broken items a new lease of life? We need skilled volunteers to act as ‘Fixers’ at a series of Repair Café events in Bournemouth. 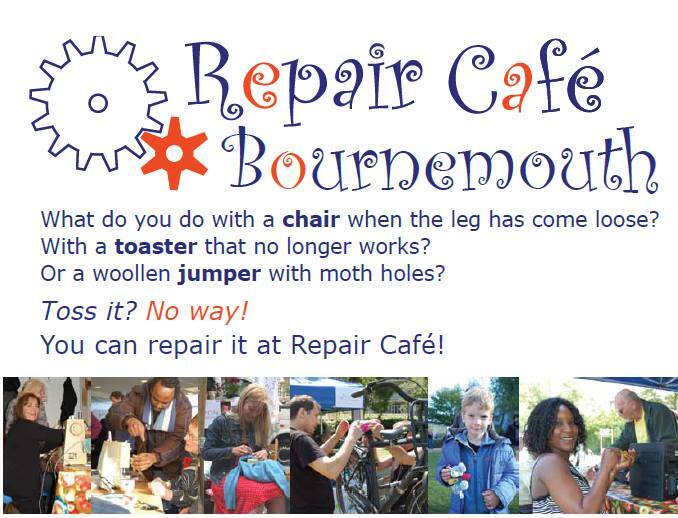 Transition Bournemouth and Bournemouth Council want to encourage local people to consider repairing damaged items, even if they are unsure how, by ‘asking the expert’ at a Repair Café and learning new skills for next time as the item is fixed. Not a repair expert but fancy being involved? Repair Cafés also need welcome volunteers to act as a host or hostess. You provide everyone with coffee and tea, help new visitors at the reception table and act as a contact for the ‘Fixers’ and the visitors in the Repair Café. Interested? To find out more come and have a chat on from 7:30pm on Wednesday 10th June at Kino Lounge (39 Bourne Close, Bournemouth BH2 6DP). Email us at transitionbournemouth@gmail.com or call 01202 451654 to let us know you will be attending or to find out more.